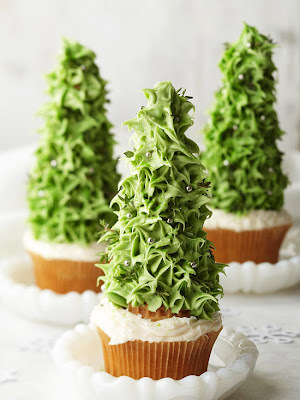 These Christmas tree cupcakes are a fun winter treat, but they are also a great addition to your gingerbread house. We have made Christmas trees out of ice cream cones for our houses before, but they always seem to look more Dr. Suess-esq than real. These are beautiful. You can see a tutorial for these ice cream cone Christmas trees over at BHG.